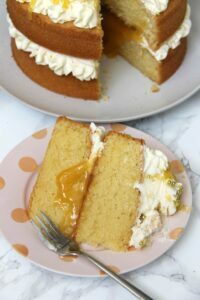 A Delicious, Light & Lemony Sponge filled with a dash of Lemon Curd, and a Luscious Lemon Buttercream! The perfect Lemon Celebration Cake for the Summer! 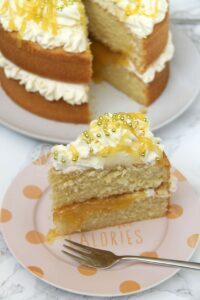 This cake ended up being a hybrid of a Victoria Sponge into something super lemony and heavenly – and its delicious. 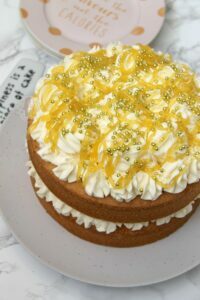 I posted my recipe for my Lemon & Poppyseed Cake a while ago and had a big success with that one, so I hope you guys like this too! Unlike my Victoria Sponge I decided to keep this as a 2 layer cake so that its easier for others to make if they only have two tins, and its easier to bake too anyway! The Drizzle aspect of this cake makes the sponge SO moist and utterly scrummy, and the buttercream gives it the light sweetness that is often craved with cake – delicious. 1) To Bake the Cakes – Grease & Line two 8″/20cm Deep Cake Tins and Preheat your oven to 180C/160C Fan! 2) With a Stand Mixer using the Paddle Attachment, beat together the Butter & Caster Sugar until smooth – this will take a couples of minutes! Once combined add the Flour, Eggs, Lemon Zest and Lemon Juice and beat until combined – try not to over beat however! 3) Pour the mixture evenly into the two tins and bake in the oven for 35-40 minutes or until a skewer comes out clean! 4) Once baked, leave the cakes to cool for 10 minutes and then remove from the tin and leave to cool completely! 5) To Decorate the Cake – Beat the Butter for a couple of minutes using the whisk attachment in a stand mixer – doing this will make it nice and smooth to add the sugar! 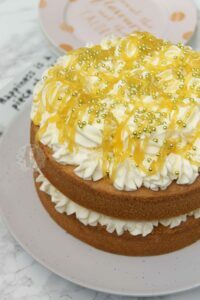 Once smooth, start gradually adding the icing sugar until its all in, and add the lemon juice – beat for about 5 minutes on a medium-high speed until super light and whipped! 6) Pipe some buttercream round the edge of the first cake, and then add the Lemon Curd into the middle. Place the other cake on top, and pipe on the rest of the buttercream. 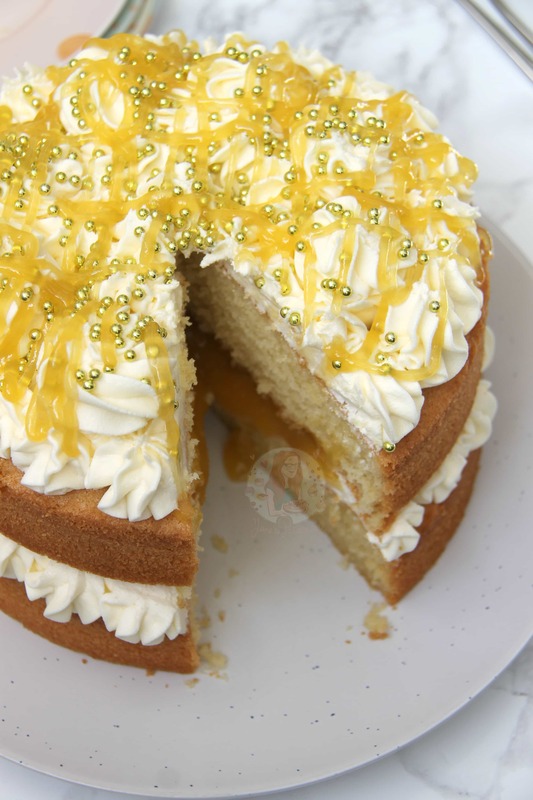 Drizzle on some spare lemon curd, and add some cute sprinkles and enjoy! I updated this recipe in May 2017 – The original recipe was 250g of each ingredient, and 5 medium eggs, and the cake was baked for about 25 minutes. You can add a lemon drizzle to the cakes as well by mixing 75ml of lemon juice with 75g of caster sugar, and drizzling over the hot baked cakes and leaving to cool. This cake will last in an airtight container for 3-4 days – probably longer as it has so much moisture! I keep mine at room temperature, but sometimes I will keep it in the fridge if I am making it ahead of a party for example! The layers are thick so if you wanted a more raised cake simply slice the two sponges in to two and have a 4 layer cake! You can find my other Cake & Lemony Recipes on my Recipes Page! Older Next post: Easy Microwaveable Fudge! Newer Previous post: No-Churn Mint Chocolate Ice-cream! Made this for my Mums birthday earlier this week – so lemony. Made it as two tiers; lovely deep cake. I bought a very good quality lemon curd as an alternative to homemade. Love your recipes, thank you. 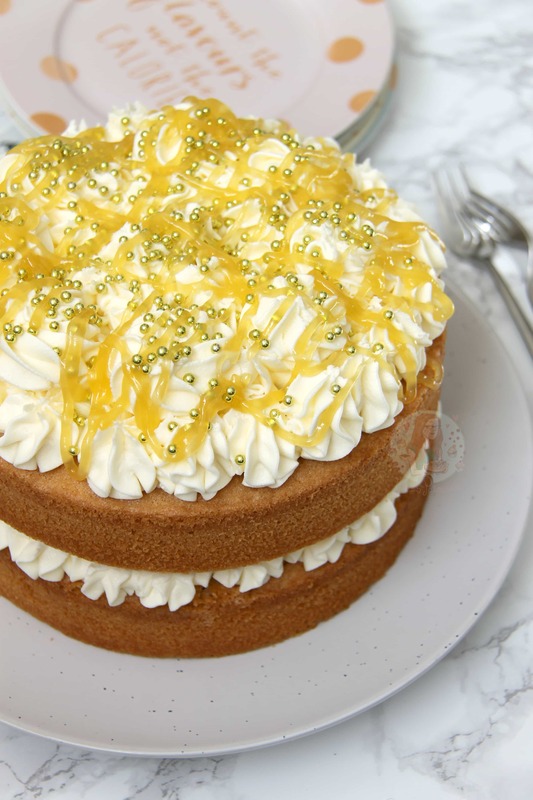 Looking to make a lemon cake for my son’s birthday, and this looks perfect. 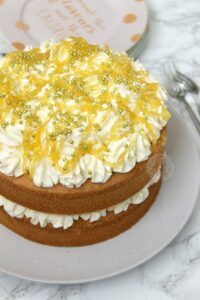 I would want to put buttercream all over the cake not just the top, is this recipe ok for that? Hi there I was just wondering if this recipe could be changed into a vanilla cake? Just swapping the lemon juice/zest and adding vanilla extract, do you think this would work? I am making 2 cakes in the shape of numbers and this recipe worked perfectly for one but I want one of them to be vanilla 🤗 absolutely love your recipes! Perfect thank you! How much vanilla extract would you recommend using please? Perfect thank you! How much vanilla essence would you recommend using please? Maybe 1tsp for the sponge, and 1tsp for the frosting?! Hi Jane, I assume the recipe works just as well with orange instead of lemon zest? I would like to use the sponges as part of a giant Jaffa cake I want to make! Thank you! Made this for my husband for his birthday and it went down a treat with him and the family. The sponge was so light and fresh. Will be making this again for sure! I read somewhere that you use Stork sometimes in your sponges. Would you do the same with this recipe? Ooh that sounds lovely! 🙂 thank you for making it! Very nice Jane! I have tried a few of your recipes and they are lovely! Stop by and visit me at lynzrealcooking! My favorite so far is the no bake chocolate cheesecake! So classic. An absolute beauty! This looks great! Going to try it! Thank you! ☺️ and please do!! A classic. To make it more adult I use a gin based sugar syrup. I really want to try a Gin & tonic cake soon so mixing it with this sounds ideal ? haha thanks! 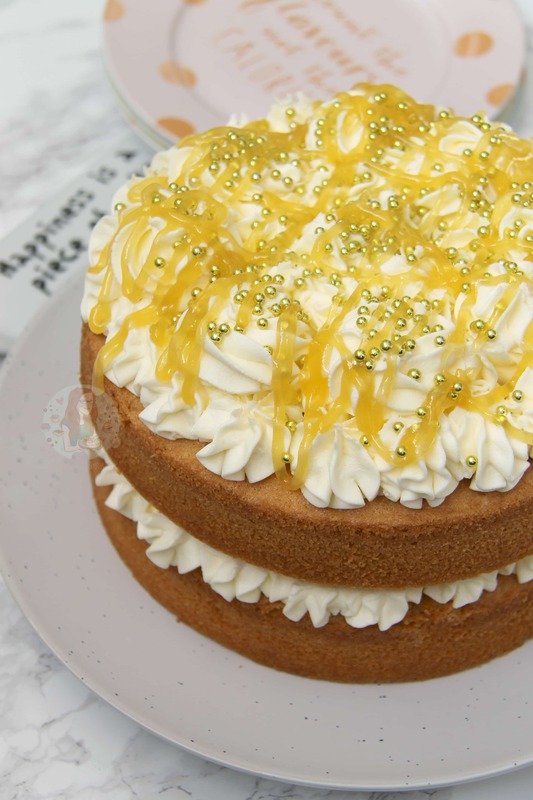 I’m not that into lemon cakes that this looks just too delicious, literally wish I could get a piece! Ohh YAY! Haha I’m so glad to have helped out there 😉 and yes maybe counting down the hours is a bit too excited?! Am loving the look and sound of this recipe and your blog! I love baking with lemons too. Your cake looks beautiful. I’m not a big fan of sponge cakes, but yours look absolutely delicious, the sponge looks to be fluffy light and moist! Would love a bite now!